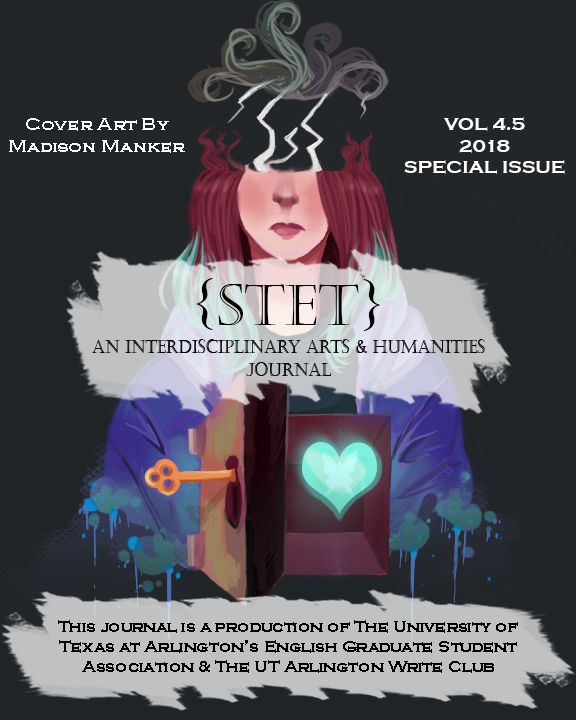 Our Mission: Stet is an interdisciplinary publication forum whose focus is to publish the creative works of UT Arlington students. While this journal services poetry and fiction, it also aims to service creations of visual, audio and experimental variety. Our editorial publishes one main issue a year, but we may also publish smaller/special issues when the editorial team desires. Because the journal has an interdisciplinary focus, it services submissions from any and all UTA students. While the our editorial team is made up of graduate students, any student may register to be part of Stet as a reviewer and author. What Do We Publish? We desire to publish UTA student fiction, non-fiction, poetry, book reviews, academic articles [under a blind but non-peer reviewed system], photography, art, music and video productions. Who Are We? This journal is a product of the UT Arlington English Department's English Language Student Association (EGSA). EGSA's President is Stephanie P. Tavera and the EGSA faculty sponsor is Dr. Penny Ingram. It is also important to note the important contribution of Digital Project Librarian Faedra Wills and the efforts of the Digital Creation Department in the Central Library. Stet could not exist without their tireless efforts and assistance. Rod Sachs should also be credited for allowing Stet to link to his video work for the De-Archive Collaboration webspace.